Global climate change is often discussed on a grand scale — melting icecaps, expanding deserts, rising sea levels, super storms and draughts. But at its core, climate change is about the energy that warms and lights our homes, cooks our food, grows our vegetables, delivers our goods. Responding to climate change means rethinking where our energy comes from and how we use it. Yet, the relationship between climate and energy is often misunderstood and manipulated in public discourse — especially in an election year. 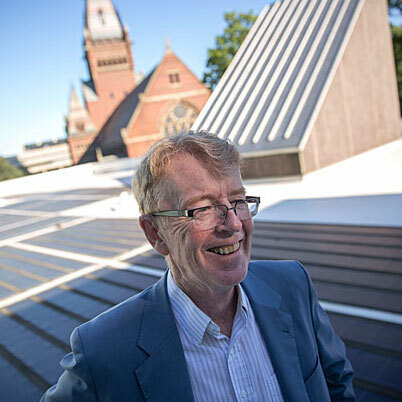 Michael McElroy, Gilbert Butler Professor of Environmental Studies at the Harvard John A. Paulson School of Engineering and Applied Sciences, recently published a book to help explain the complexities of climate and energy to students, scholars, and politicians. In “Energy and Climate: Vision for the Future,” McElroy argues that the United States must move towards a zero-carbon future, replacing its reliance on fossil fuels with a combination of wind, solar, hydroelectric and nuclear power. Such a transition would not only help address climate change and improve air quality but also reduce the cost of electricity and transportation and create millions of jobs in the U.S.
We spoke with McElroy about the book, why climate change is a political issue in the U.S. and the impact President-elect Donald Trump may have on the future of energy and climate.